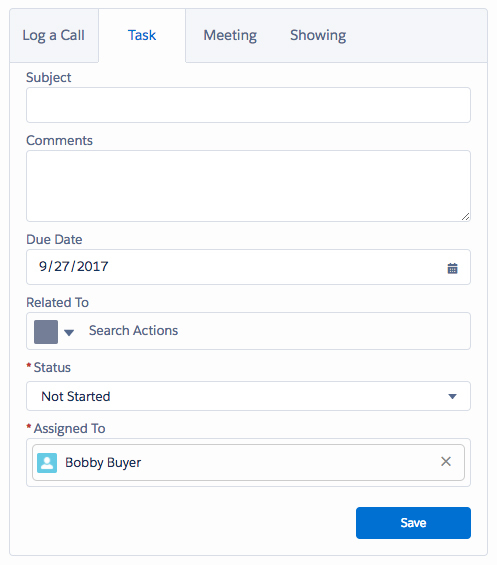 In Propertybase, you have the ability to track all of your phone calls, emails, tasks and property showings in one place. 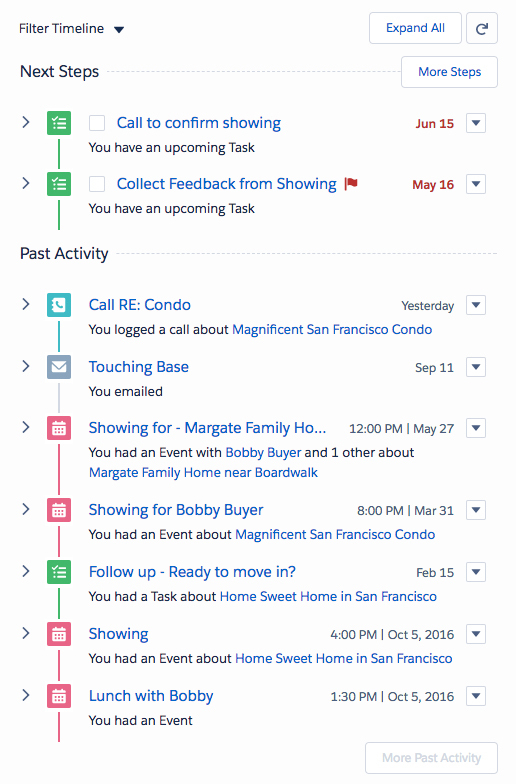 Propertybase tracks these as Activities and display them on a timeline for easy referencing. Every activity is associated with one or more records and displayed when viewing those records. For example: when you log a showing in Propertybase, that showing is now associated with all contacts present at the showing, as well as the listing being shown. 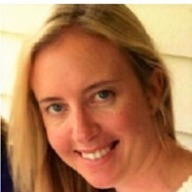 That activity will display whenever you view a Contact or Listing record associated with it. Activity tracking is available on every object in Propertybase. You can access activity by opening any record type and clicking the activity tab on the right side of the screen. 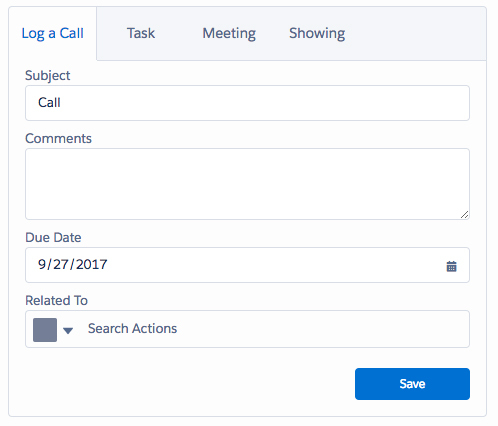 The following activities can be tracked in Propertybase: phone calls, tasks, meetings and showings. These can be accessed by clicking the respective tabs within activity. When you make a phone call, this is where you record it. Available fields are subject, comments, due date and related to. Anytime you need to schedule a task, like a future showing, upcoming phone call or follow-up email, this is where you do it. 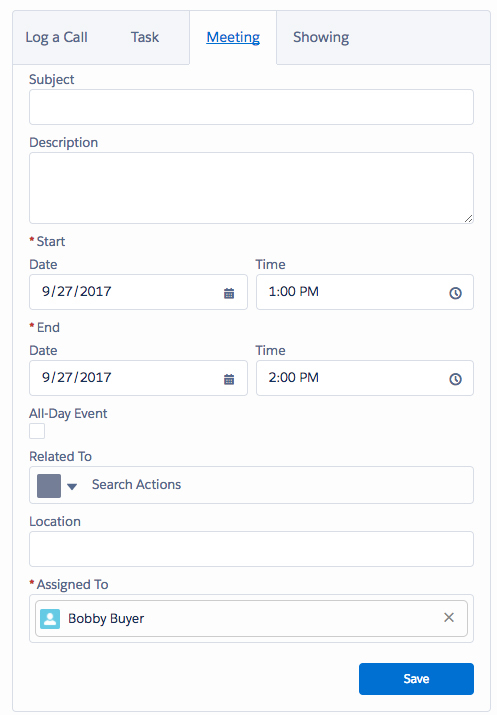 Available fields are subject, comments, due date, related, status and assigned to. You can also create new tasks from the top level menu. This is where you schedule meetings. Available fields are similar to any meeting scheduling tool and these show up on your Propertybase calendar. This is where you schedule property showings. Available fields are similar to any meeting scheduling tool and these show up on your Propertybase calendar. 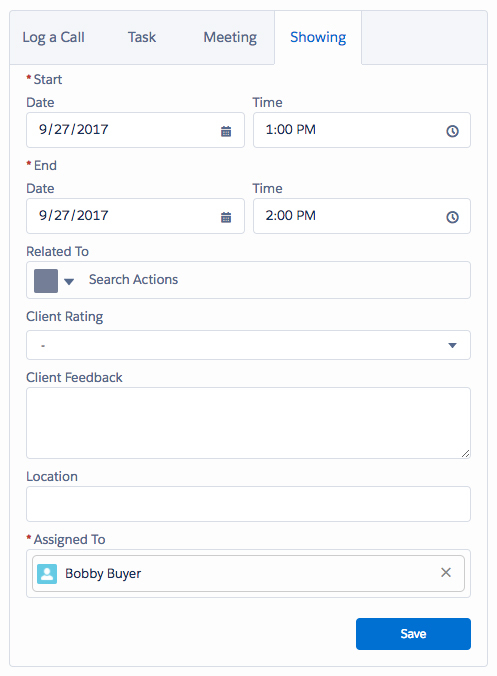 Showings also include client rating and feedback fields. The activity timeline shows all your activity, split between upcoming and completed activity, ordered by newest to oldest. 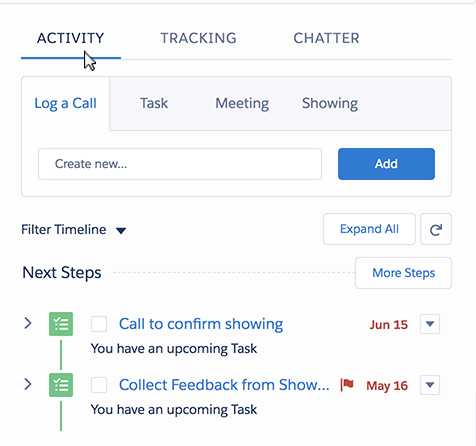 You can select any activity to view more details or click the drop down arrow to view available actions. This is Part 3 of 12 in our Getting Started with Propertybase series. We recommend you continue to follow along, in order, as we walk through the entire Propertybase process, from lead to close. Once you have an understanding of how Contact and Activity management works in Propertybase, the next step is understanding how Inquiries work. Tracking Inquiries in Propertybase provides powerful features like property matching and more. You can access Inquiries by clicking the Inquiries tab at the top of the screen. Alternatively, you can access an Inquiry from the Contact record by clicking on the Related tab and under Inquires, selecting a record.